Yesterday began my attempt to introduce a Christmas album a day until December 25th. Some nice responses, including one from my sister-in-law, who informed me that her whole family enjoys listening to The Animals’ Christmas, which was my first suggestion. I think that’s a great idea, actually. Most people put Christmas music on just to put them in the holiday mood, or as background music, but there’s something extra nice about sitting and actually listening to the music. Sitting by the fire, Christmas lights twinkling, with a wonderful album playing, can be a lovely way to spend an evening. And there is no shortage of musical styles to enjoy within the Christmas music genre. Everything from true jazz albums like Wynton Marsalis’ Crescent City Christmas Card or Christmas Jazz Jam, to the traditional stylings of Perry Como, Bing Crosby, or Andy Williams. You have pop-inspired albums like Mariah Carey’s Merry Christmas to You to instrumental classics like Mannheim Steamroller’s Christmas. And you also have those genre-busting albums like Billy Idol’s Happy Holidays: Noel Rebel Yell (and yes, it’s better than you may think it would be) and Stan Freberg’s mini-musical satire, Green Chri$tma$. The good thing about Christmas music is that no matter what style you like, you can find a version of “Away in the Manger” you’ll appreciate. And then you have albums that seem to transcend any particular style. And that is what today’s album is. A true Christmas classic that actually served as the inspiration for another classic album more than 20 years later. If you’re not familiar with the name Spike Jones, then you didn’t grow up in the 1940’s and 1950’s. Spike Jones and His City Slickers were some of the finest musicians, musical satirists, and flat-out funny recording artists of the 20th century. You’re probably most familiar with two songs that every kid has annoyed their parents by singing during the holidays, “All I Want for Christmas is My Two Front Teeth,” and “I’m Getting Nuttin’ for Christmas.” These comedy songs were gold when they were released and became huge hits in their own right. Of course, Spike was already famous for his recording of “Der Fuhrer’s Face” from the Donald Duck cartoon of the same name–a song which made clear that the Nazis were “Nutzi” and managed to blow raspberries at Adolf Hitler, Goebbels, and the rest. Exactly who you think would be perfect for a Christmas recording, right? Let’s Sing a Song of Christmas will definitely surprise you. The artist famous for blowing whistles and sirens during his songs, who made no secret of his love for skewering schmaltz, put out one of the most beautiful–and at the same time gently satirical–holiday collections of all time. And this collection, which bring his music together on one album, is spot-on perfect, and the music can be divided into three musical styles: “kiddie comedy,” choral, and sacred. Through it all, the arrangements of both choir, orchestra, and band, is simply beautiful, and the chorus’ harmonies are intricately-wound and jazz-perfect tight. The chorus songs are absolutely wonderful. The choral arrangements by Judd Conlon, who was one of the primary musical arrangers for Walt Disney Studios in the 1950’s (his chorus is also heard singing on the soundtracks to Alice in Wonderland, Peter Pan, Cinderella, and more), are beautiful. You've Heard Those Voices Before. At times lovely, often charming, and always sung with impeccable style by the Judd Conlon Chorus, they are the true highlight of the collection. Some of the songs are obscure and have only been heard on this album. (And one more, but that comes later.) “First Snowfall/Let It Snow! Let It Snow! Let It Snow!” and “Winter Wonderland/Silver Bells/White Christmas” are two standout medleys where the Spike Jones style only slightly intrudes on the proceedings. “Christmas Alphabet/Merry Christmas Polka,” “Christmas Island,” as well as the more expected songs, all sound fresh and bright in the classic 1950’s choral sound, and put to shame most other versions you may be familiar with. One of the standout medleys on the album is “It’s Christmas Time/Sleep Well, Little Children.” The first song is a bright, madrigal-like song that segues beautifully from the quick melody of the opener to a haunting and lovely lullaby. It’s an a capella piece featuring Dennis Day in one of his two solos on the album. Dennis Day was an “Irish tenor” who gained huge fame on The Jack Benny Show. He also has a Disney connection as the sole performer in Disney’s story of Johnny Appleseed. It’s just a beautiful song, perfect for listening to before bed on Christmas Eve. The sacred songs are what you would expect, familiar carols in bright and cheerful arrangements. The Judd Conlon Chorus delivers standout performances on every single one, with special mention being given to their version of “Silent Night” (reminding me Stokowski’s arrangement of “Ave Maria” from Fantasia) and a new arrangement of Brahms’ Lullaby that becomes “Christmas Cradle Song.” It’s clearly of it’s time–you can almost see Donna Reed tucking the kids on her TV show, and the whole album feels like it only exists in black and white, but it’s just such a great selection of songs, perfectly arranged, that even the hardest-hearted cynic will have a hard time keeping his heart from growing two or three sizes by the time the album is done. 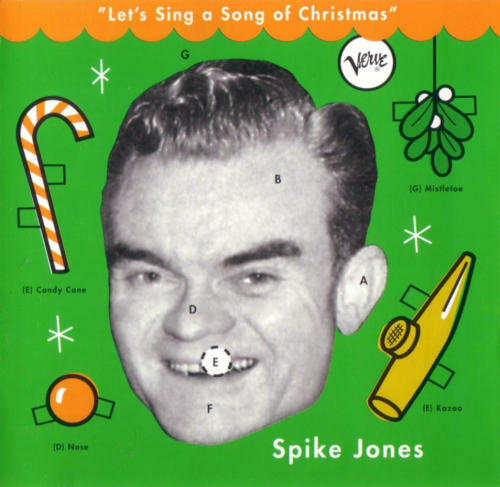 Spike Jones Let’s Sing a Song of Christmas features 20 songs, and almost all of them are standouts. What’s amazing is that this album, and it’s arrangements by Jones and Conlon, ended up influencing another artist nearly 20 years later. Some of the titles I’ve mentioned may sound familiar to you, especially if you came of age in the 1970’s and 1980’s. 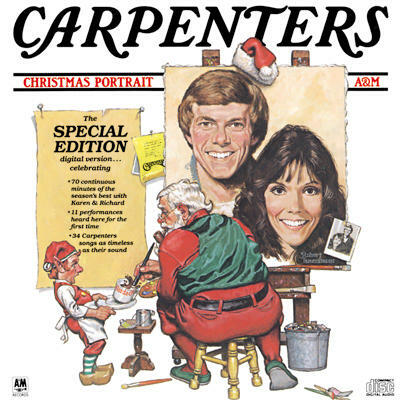 One of the biggest “traditional” Christmas albums of that time period borrowed, practically in wholesale, the arrangements and style of this album. If you love truly traditional-sounding Christmas music, with wonderful songs, amazing arrangements, and a bit of fun, I highly highly highly recommend Spike Jones’ Let’s Sing a Song of Christmas. It’s still in print by his label, Verve (yes, the jazz label home of most of the genre’s greats), and it’s also available via digital download on iTunes or via Amazon. One listen to “It’s Christmas Time/Sleep Well, Little Children,” and you’ll know you’ve made the right choice. Listen to samples from the album here.